As you contemplate your taxes for 2018, you might not be jumping for joy – and while it won’t be of any solace, it could be of interest that the root of this onerous business goes back to 1794 and carriages. At the time, the federal government was hurting for money, due to the costs of the Revolutionary War. There were no income taxes (not until 1913 and the 16th Amendment) and money was needed to fight off the Native Americans and the continuing menace from Britain. When still in office in 1792, Alexander Hamilton had suggested an excise tax on carriages among other goods. At the time, personal carriages were considered luxuries as they were mainly owned by the more well-to-do living in cities. 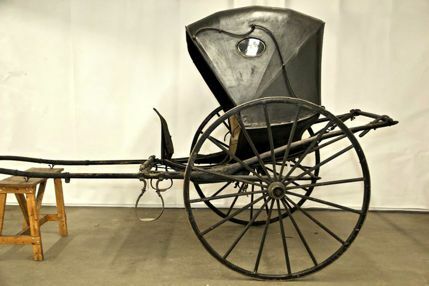 The carriage taxes were graded from a maximum rate of $10 on a coach, $8 on a chariot, own to $6 on any other four wheeled carriage and $2 on a chaise or other two wheeled vehicle. Just like today, there were penalties for non-payment. Then, as now, the citizens of our country were not thrilled with a new tax and a case promptly proceeded to the Supreme Court with Hylton v. United States. (Hylton was a Virginia farmer who just flatly refused to pay the tax or the penalty.) It was the first act of Congress to appear before the Supreme Court for review. Hamilton, in ill-health at the time, traveled to Philadelphia to argue the case on February 24, 1796. In his argument he emphasized the broad power of taxation granted to Congress in the Constitution. The case was held in favor of the United States and excise taxes were levied on personal use carriages throughout the country. Commercial use, farm wagons, carts and drays were excluded. The tax eventually expired, but not without consequences. As a footnote, Hylton v. the United States was cited in support of the Affordable Care Act insurance mandate in 2012. The Carriage Monthly, 40th Anniversary Historical Number, April 1904, Reprint 2012. Statutes and Stories, “Carriage Act of 1794,” (statutesandstories.com). 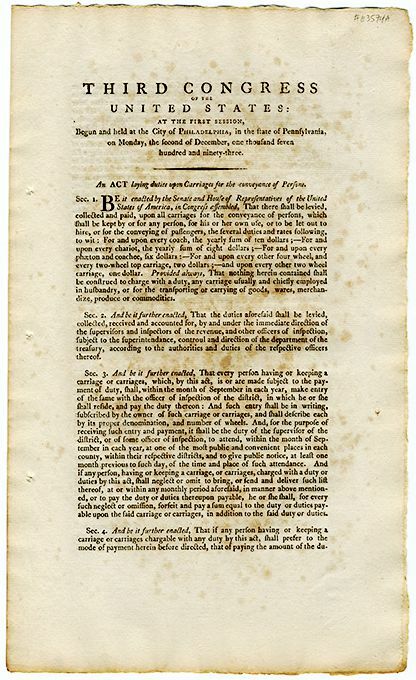 The Carriage Act of 1794, “An act laying duties upon carriages for the conveyance of persons,” dated December 2, 1793, by the Third Congress of the United States, Philadelphia, Pennsylvania. Chaise – taxed at $2 by the Carriage Act of 1794. According to online inflation calculators, this amount is equivalent to about $46 in today’s dollars.